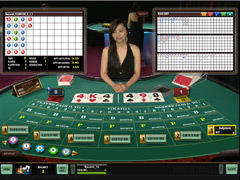 Summary Spin Palace shares the Microgaming live feed with Ruby Fortune and bgo Macau. The Microgaming feed is excellent, offering a very realistic setting, but as with Ruby Fortune, Spin Palace is aimed at the lower stakes gambler, with an upper bet limit of just £25 in Roulette. Higher stakes players would be better advised to play at bgo Macau, where the table limit in Roulette is 10 times higher - up to a maximum of £250. Table limits Minimum £10, Maximum £500. 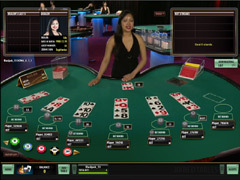 Available tables Spin Palace has 35 Baccarat tables available 24/7. Summary Decent stake bets are accepted at Spin Palace with plenty of tables available throughout the day. 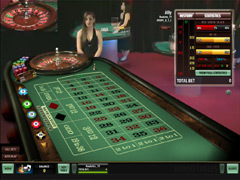 Summary Players can bet decent amounts on Blackjack at Spin Palace, however getting a seat is difficult, though the casino does offer the Bet Behind facility. Table limits Minimum £0.50, Maximum £25. Available tables There are 24 tables available to play roulette throughout the day. Summary Game speed here is very fast and with a low minimum stake, players can try out any system they find without risking too much.